5% Earnings on your first $5,000 in purchases every year. Unlimited 2% Earnings on every purchase after that. Redeem Earnings toward the purchase or lease of a new Chevrolet, Buick, GMC or Cadillac vehicle. No annual fee, no redemption limits, no Earnings expiration, no foreign transaction fees. Save even more when you combine your available Earnings with most current GM offers and incentives. With the GM BuyPower Card from Capital One®, everyday purchases - even putting gas in your current car - will help you out when it comes time to purchase or lease your next car. GM BuyPower Card from Capital One® card members receive 5% back on their first $5,000 spent with the card each account year and 2% back on every dollar spent beyond that. Those rewards can then be redeemed toward the lease or purchase a new Chevrolet, Buick, GMC or Cadillac vehicle. With no limit to the amount of earnings you can accumulate or redeem toward your new vehicle, and with no expiration date on your earnings, the GM BuyPower Card from Capital One® is a good option for those looking to save for their next car purchase without even thinking about it. Plus, CardName cardholders can combine earnings with current GM offers and incentives, allowing cardholders to maximize benefits and savings. 5% earnings on every dollar spent up to $5,000 each account year. Unlimited 2% earnings on every dollar spent over $5,000 each account year. No annual fee, no redemption limits, no balance transfer fee, no earning expiration dates and no foreign transaction fees. Additional savings are available when you combine your earnings with current GM offers and incentives. 0% intro APR on purchases for the first 12 months. With earning rates of 5 percent for the first $5,000 spent each account year and 2 percent on everything after that, you stand to rack up rewards at a decent clip. Rewards can only be redeemed toward the purchase or lease of a new GM vehicle, so you can think of this card as a sort of savings plan for your next vehicle. Take advantage of zero interest on purchases for the first 12 months with this card. This isn't a traditional cash-back card – you can't redeem for cash directly into your wallet or bank account – so if you're looking for literal cash rewards this isn't the card for you. The GM BuyPower Card from Capital One® is unique in that it gains you earnings to be used specifically towards the leasing or purchasing of a new vehicle, but while some other rewards cards are limited to point gain only on select purchases, the GM BuyPower Card from Capital One® allows you to earn points on every purchase made, making it an appealing option for those looking to use the card for everyday purchases. Keep in mind that this isn't a cash-back card, per se, and there's no option to redeem points directly back into your bank account or wallet, but that also means you won't be tempted to spend your rewards on anything other than that next new car purchase or lease. With 5% earnings on the first $5,000 spent, and 2% earnings on everything beyond that, GM BuyPower Card from Capital One® cardholders can quickly and easily gain earnings to use towards leasing or purchasing a new Chevrolet, Buick, GMC, or Cadillac vehicle. Even if you only collect 5% on the first $5,000, you'll earn $250 a year in rewards. Make this your go-to credit card and you stand to accumulate substantially more. GM BuyPower Card from Capital One® cardholders have the opportunity to use earnings toward upgrade options like leather seats, remote keyless entry or premium sound systems, allowing members to enjoy luxury perks of a vehicle they might not otherwise be able to experience without those GM BuyPower Card from Capital One® points. Furthermore, with no annual fees, no redemption limits and no earnings expiration dates, the GM BuyPower Card from Capital One® could be a good choice for those looking to use the card long term to accumulate earnings over an extended period of time. Since cardholders have the ability to gain 5% back on $5,000 each year, long-term use of the card allows GM BuyPower Card from Capital One® cardholders to maximize point earnings, making it a good option for those looking a few years ahead to their next new car. While no earning expiration dates could be beneficial for those GM BuyPower Card from Capital One® cardholders who are in no hurry to cash in on their points, those looking to quickly redeem their earnings might not like the 2% earnings rate that cardholders earn after spending their first $5,000. Cardholders can quickly earn their first $250 once they reach that $5,000 level, but after that, it will take more than double the spending (just over $12,000), to accumulate the same earnings with the 2% earnings rate. 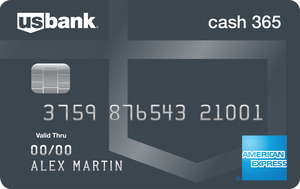 Furthermore, this isn't really an "instant-gratification" cash-back card; in fact, it's not a literal cash-back credit card at all -- more of a niche cash-back card. The only option for redeeming your rewards is during the purchase or lease of a particular make of vehicle, so if you aren't sure you'll be buying one of those vehicles in the future, this card's rewards could go unused. Additionally, though GM BuyPower Card from Capital One® cardholders can combine earnings with current GM offers and incentives, earnings may not be combined with the GM Employee Purchase Program, GM Supplier Discount Program, GM Employee QRD Purchase Program/Company Owner Vehicle Program, Credit Union Member Discount from GM, or any other GM BuyPower Card or GM Card Product Earnings Program, including GM Business Card Earnings. While this is unlikely to affect most GM BuyPower Card from Capital One® members, it could be a disadvantage for GM employees and for anyone participating in these programs looking to maximize their benefits and savings. With no annual fees and an earning rate of at least 1.5% cash back on every purchase made, Chase Freedom Unlimited® is a good option to consider for those not specifically interested in applying earnings towards the purchase of a car. Similar to the GM BuyPower Card from Capital One®, the Chase Freedom Unlimited® card allows you to gain earnings on all purchases made, making it a good choice for those looking to benefit from using the card for everyday expenses. Furthermore, new cardholders earn 3% cash back on up to $20,000 spent in the first year, then 1.5% on all purchases. And, also like with the GM BuyPower Card from Capital One®, Chase Freedom Unlimited® rewards do not expire as long as the account stays open. 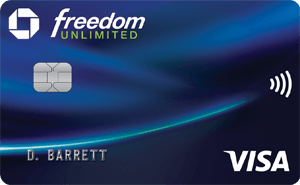 Lastly, the Chase Freedom Unlimited® card is a traditional cash-back credit card in that you can redeem your rewards for cash as well as for a variety of other travel, products and services. Looking for the flexibility to redeem points towards flights, hotels, vacation packages, cruises, rental cars, and baggage fees? While the GM BuyPower Card from Capital One® and the Chase Freedom Unlimited® card are good card options for cash back and car purchase earnings, the Bank of America® Travel Rewards credit card is a worthy contender for those looking to earn great travel rewards by using their credit card. The Bank of America® Travel Rewards credit card earns you an unlimited 1.5 points per dollar spent on all purchases, and 25,000 bonus points after spending $1,000 in the first 90 days of opening an account. Plus, it also gains Bank of America® members who have an active checking or savings account an additional 10% customer point bonus on every purchase (that jumps to 25% or more for Preferred Rewards clients), allowing these cardholders to make the most out of the card's benefits. Also like the GM BuyPower Card from Capital One® and the Chase Freedom Unlimited® card, the Bank of America® Travel Rewards credit card has no annual fee, and points do not expire as long as the card is active. It also has no foreign transaction fees, making it a viable option for frequent international travelers. If you're in the market for a card that helps you save, but aren't necessarily in the market for a new car anytime in the next several years, you might want to consider the Fidelity® Rewards Visa Signature® Card. Fidelity® Rewards Visa Signature® Card members can get unlimited 2% cash back into an eligible Fidelity account to either spend or invest. Your rewards can be deposited directly into one or several Fidelity savings accounts, including Fidelity-managed 529 College Savings plans, brokerage accounts, IRAs and retirement accounts. That means your purchases today could casually build up in your savings for the future. Up for grabs is also a $100 bonus offer you can receive after spending $1,000 within the first 90 days of opening an account. There's no annual fee for the Fidelity® Rewards Visa Signature® Card, but you will pay a 1% foreign transaction fee for each purchase made while abroad. 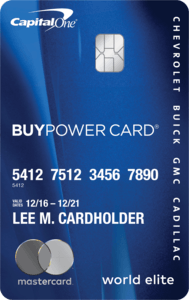 Though the GM BuyPower Card from Capital One® does not offer much flexibility in how you can redeem your earnings, it does gain points on all purchases, which makes it a practical card to keep in your wallet if you are looking to lease or purchase a new Chevrolet, Buick, GMC or Cadillac vehicle in the next several years. It has low fees, so there's no worry of offsetting fees with your earnings each year. With 5% earnings on every dollar spent up to $5,000, and 2% on every dollar spent after that each year, the GM BuyPower Card from Capital One® is an ideal choice for those loyal to the GM brand and who are looking to accumulate earnings long term to apply to upgrade options or the lease or purchase a new GM vehicle.